Nothing makes an AV nerd happier than watching a great TV show with an original take on professional audiovisual technology. It’s fun to see industry names make their way into mainstream storytelling. I jumped out of my seat when I saw a Crestron touchpanel in use during a courtroom scene in the moody Swedish Noir program Wallander. Stranger Things is a love letter to AV clubs. Then there's Black Mirror, the brilliantly bleak inheritor of The Twilight Zone. Black Mirror is known for its bracing portrayal of a tech dystopia, and it also weaves authentic portrayals of proAV within its story lines. 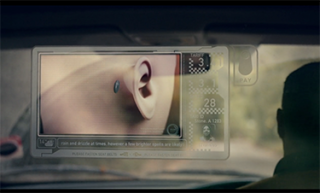 This is high-concept sci-fi, but Black Mirror gets four things right about the state of AV technology. Will every surface become a high-res screen, like in this scene in “The Entire History of You” (season one)? Projection mapping and pliable OLED, like LG's OLED Wallpaper, are taking us closer. The episode “Hated in the Nation” is a high-tech twist on the police procedural. The characters not only use slick computing technology, data visualization adds to the suspense. DCI Karin Parke and DC Blue Coulson watch the (horror) story of data unfold in real time. Having a bee in your bonnet takes on a whole other level of meaning in Black Mirror (season three). The autonomous bees are IoT devices that go rogue, causing panic, pain, and mayhem. I found the IoT angle unique. It started with one bad node then the whole system was overridden. A high-tech hive mind at its worst. UHD multi-touch video walls are nothing new, but their quality and interactivity features keep increasing. In "Hated in the Nation” (season three), drama unfolds in high-tech command centers and on installed multi-touch surfaces. The terrific manufacturer TVLogic gets great product placement in this pivotal scene (“Hated in the Nation”).Bravo to the Black Mirror production team. What are your favorite AV cameos in this Golden Age of Television? Tweet me a screenshot @AVTechnologyMag. Margot Douaihy is the editorial director of AV Technology.